Catching Up With The Shock, Pierre, The Oaks & …….Stella ! Jeremy Shockey not being retained by the Saints generated a mix of emotions. Clearly, he was a fan favorite, but also evident was his advancing age and limited production due to injury. Wunderkind young talent Jimmy Graham at the tight end position made the decision easier for the front office after the bean counters were through with it. And fans by and large understood, just before they rushed to stores, in an end run to purchase a Jeremy jersey as a memento in the making. The Shock brought a feisty attitude to the offense, a baton inherited by young running back Chris Ivory. David Thomas is an able backup to Graham, but #88 is still a loss, because coaches don’t lie when they say you can’t have too many good players at a position. Rosters in today’s NFL can get brittle, like last season’s Saints did, and depth wins the titles at the end of the show. On the other hand, Pierre Thomas has been secured for four more years. ‘Dis is good news. As said on here once before, they’d have been no Super Bowl for New Orleans without Pierre Thomas. The Tale Of The Tape shows it was he who got the fourth and inches, before Hartley’s field goal in overtime to beat the Vikings. In the big game itself, he took a swing pass from Brees and careened about fifteen yards into the end zone on the drive following the onsides kick. And before The Shock’s short, go ahead touchdown catch, it was Thomas who jammmed the ball to within inches of the Colt goal line. These plays are just a glimpse of Thomas’ production story here. As his agent inevitably reminded Saints brass during contract negoatiations, Pierre has in fact done for the Saints a large part of what Reggie Bush was brought here to do, which is run effectively and weave himself smoothly into Drew Brees’ passing game, particularly the screen. Saints brass likely considered (with the agent) the short career spans of running backs, a high incidence of injury among them, evidenced by Thomas’ lingering ankle problem all of 2010 that agitated Sean Payton, to the extent he expressed it publicly, whether it was an unintentional spill, or motivational ploy. The bum ankle and Coach’s feelings about it did appear to have Thomas one foot out of the door heading into this off-season. Cynically, some may have had the opinion Thomas was on cruise control, in no rush to get back out there, go full bore and risk it all, until he got the contract he wanted, whether that was here or somewhere else. Thomas’ situation was kind of a no man’s land, inviting the “is it a business, or is it a game” talk, unfortunately. And General Manager Loomis had reasons to have confidence in his scouts to pluck another useful RB or two from the lower rounds of the draft, or from the pickings of undrafted ones out of college, which is how Thomas got here in the first place. Running backs do not dominate the pro game anymore, as it has evolved into a passing clinic – from rule making to marketing. Guys like Jim Brown, Gale Sayers, Walter Payton, Eric Dickerson, and Barry Sanders simply took over games for teams that had little chance to win without them, just like today’s handful of marquee quarterbacks. Tony Dorsett was in that class talent wise, but Tom Landry’s offenses were versatile enough to where the Cowboys could win without a big day from him. Later on in Dallas, Emmit Smith gained more yards than all of them and was a big – but not the sole – reason Dallas won multiple Super Bowls in the 90’s. LaDainian Tomlinson had a long, spectacular career in San Diego for a team that could not get over the hump, is under appreciated because of that, besides being in a small west coast market. He may have been the last of the Great Ones at running back, and it’s pleasantry to see him have some success as a spot player with the Jets, while his sun sets. The kid in Tennesee, Chris Johnson, oozes with speed, moves, and elusiveness, but it is unlikely he can take the Titans close to all the way. The game has changed. Anyway, when it came right down to it on Airline Drive, the Saints let their dollars make sense, and kept Thomas, avoiding the haughtiness of thinking they could just go out and find another one as effective as him, the vogue thinking about RB’s in other front offices around the rest of the league. Pierre has sneaky strength, excellent balance, and the right kind of instincts, which is why he resembles a Pinball Wizard, bouncing off tackles once, then twice, churning, and leaning for extra yards, and wrapping up the ball in process. Not many passes leave his fingertips, either. He may not have the forty yard dash time, bench press rep count, vertical leap, or shuttle time that scouts drool over in the spring combines for new prospects, but what those can’t capture, no matter how hard they try, is how good a player one actually is, and Pierre Thomas is a very good football player. And a great fit for the Saints. Of course, with players now locked out by owners in the league’s collective bargaining situation, who gets released or re-signed may be a moot point for the time being. Magnanimous postures and positioning are being taken all over the place, by all kinds of parties, regarding the CBA. Media mouths are roaring, camp flags are flying, and the courts have an increased case load. The choice here is ignore most of it for now. It is, after all, March, for goodness sakes. March has much less urgency than August does, which is just pre-season, and comes with its own gusts of hot air. 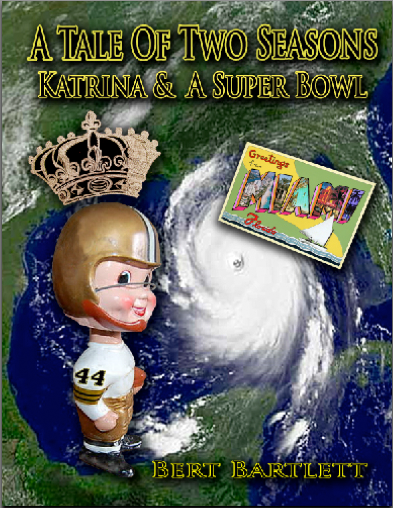 Unexpectedly, March has so far been kind to the book, A Tale Of Two Seasons, Katrina & A Super Bowl. The following Saturday, March 26th, I am delighted to be a panelist on, to my knowledge, the first panel ever devoted to the challenges of writing about the Saints (and there are a few), at the Tennessee Williams New Orleans Literary Festival, in the French Quarter. Jeff Duncan of the Times Picayune (and author of Bags To Riches) will be on it, as will Ellis Henican, author of Home Team with Sean Payton. Moderated by Fletcher Mackel of WDSU TV. A preliminary post game plan may have some folks afterwards sauntering down Bourbon to the Old Absinthe House, to tip a refreshment, Under The Helmets. Needless to say, all Souls Of The Saints are invited to any goings on, and hopefully it’s being made clear that all are being thought of, without whom, there’d be no ‘Soul’……..